In awe of these diminutive paper flowers created by Japanese designer, Haruka Misawa. Inspired by pencil shavings she uses layers of paper with color gradation rolled tightly into a cylinder then shaved into a pencil sharpener. The one-of-a-kind flowers are no larger than an inch and a half and are difficult to replicate making each piece totally unique. You can see more of her work on her website as well as on Instagram. Images: Courtesy of Haruka Misawa. 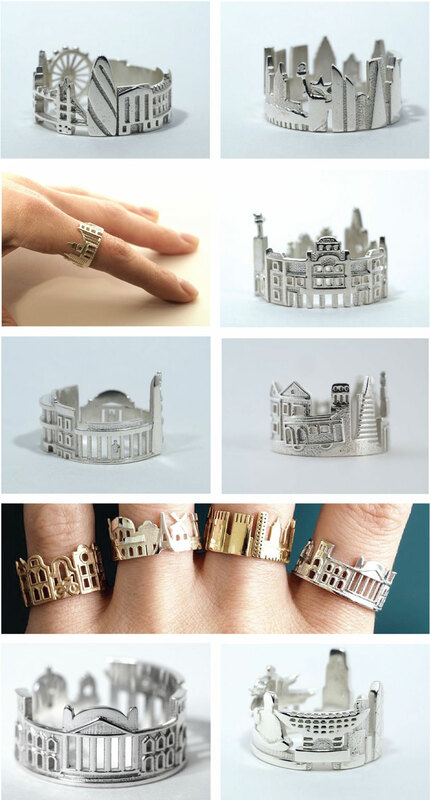 goldsmith, Ola Shekhtman, has created these delicate bands of cityscapes that highlight the city’s popular landmarks. The Siberian born jewelry designer learned her craft in St. Petersburg, Russia and also attended 3d modeling courses in New York City. She has since created twelve iconic skylines which she sells at her Etsy shop, Shekhtwoman. Images: Courtesy of Ola Shekhtman.